Known for her challenging yet creatively playful yoga classes, Rachel Barringer strives to help her students feel empowered through alignment-based movement. In her own practice, Rachel focuses on building core strength and balanced flexibility, leading to a more rich and fulfilling experience of life off the mat. She takes particular interest in breaking down seemingly impossible poses into smaller components, making them accessible to her students. She has been teaching in the Boston area since 2008, and she continues to find her practice and teaching to be an outlet for her ever-expanding curiosity of movement and kinesthetic awareness. 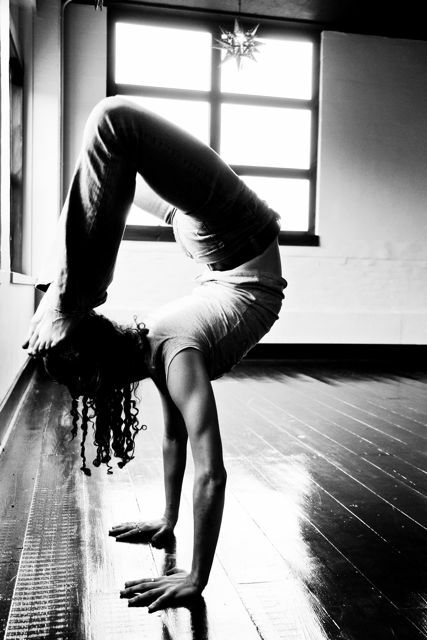 Some of her most influential yoga teachers are Ana Forrest, Georgia Reath, Todd Skoglund, and David Vendetti. A classically-trained cellist, Rachel was drawn to yoga as a way to relieve performance anxiety while she was a music major in college. Immediately she began experiencing the multitude of other benefits and realized that yoga was forever going to be a part of her life. Copyright 2009 LadyRayCello. All rights reserved.